This is going to be a tough battle of Roomba 690 vs. Roomba 890. I am not only going to discuss the difference between Roomba 690 and 890 but also advantages, disadvantages and which one you should buy? I am going to compare the design, size, accessories, cleaning performance, usability, battery, noise, value, warranty, and return policy of both vacuums. Once you know every little detail about both vacuums, Choosing one will be easier for you. Roomba 690 vs. 890, Which Should You Buy? Should You Buy the Roomba 890? Well, both of these robots belong to different series but are extremely identical to each other. Regarding performance, the Roomba 890 is simply better. It also comes with additional features which are the reason for incredible performance but also the higher price tag. The memory mapping feature is an intuitive addition and the advanced brush roll makes the maintenance breeze, especially for homes with pets or long-haired people. Still reading? Let’s explore these robots in more details. The Roomba 690 robot vacuum is a powerful budget-friendly machine that brings wifi connectivity, voice control, and delivers great performance. The Roomba 690 also brings a virtual wall barrier, bristle style brush roll, and navigates with iAdapt 1.0 navigation technology. It lacks the memory feature and advanced brush roll like the newer models, but still delivers great value at this price point. The Roomba 690 offers exceptional cleaning performance and a user-friendly interface. This makes is an easy and effective robot vacuum to run. Comes with amazing features but pet hairs can be a problem for this vacuum. Lastly, it has become best-selling due to the lower price tag. Bristle style brushrolls cannot easy to maintain, but it depends on debris types and uses. Pet hairs can be a problem for this brush. The Roomba 890 robot vacuum is an expensive machine that comes with significant upgrades. Although it brings similar features to the Roomba 690 like voice control, wifi connectivity, scheduled cleaning, and excellent cleaning performance but it also boasts advanced HEPA filtration, memory-mapping feature, advanced dual brushrolls, and a full bin indicator. The Roomba 890 is a pricier robot vacuum that not only gives excellent cleaning performance but the advanced features are helpful for pet owners as well. The brush roll maintenance and cleanup of the robot are also easier and the biggest advantage is the memory-mapping which allows the robot to clean the home intelligently even if you have a tricky home layout or multiple rooms. Memory-mapping technology allows the robot to navigate wisely in your home. Advanced dual brush rollers can deal with pet hairs, so nothing to worry about the brush getting tangled. Cleaning performance is identical to Roomba 690. The Roomba 690 has a two-tone aesthetic, using black and silver, with bright green accents for special features. The carrying handle and dust bin release are represented as green. The central panel contains a button “CLEAN” which starts an auto-clean cycle. To perform scheduled cleanings, you can use the iRobot Home app or voice commands using Google Assistant or Amazon Alexa. The Roomba 890 shares several design points with the Roomba 690. Even the cleaning button, handle placement, bumper style, and dust bin release are all similar to the Roomba 690. The aesthetic of the 890 is a little more cohesive with the dark gray and black. It doesn’t have any bright colored accents, that note special features, Whereas, the design is simple and intuitive. Cleaning is achieved with the help of spinning side brush, central bristle style brush roll, and vacuum suction. The dust and debris on the edges are pushed by the spinning side brushes into the path of the central bristle brush roll and the suction takes care of the rest. The lifespan of the central roll brush is equivalent to the dual brushrolls and costs a little less to replace. Navigation of this robot totally depends on the dirt detection and infrared light sensors as it lacks memory-mapping which is available in the 890. The navigation can be clumsy but the dirt detection feature helps a lot to clean areas with stubborn stains and keeps cleaning until the stains are removed. Edge sensors along the front side combined with drop detection technology eliminates the danger or vacuum driving over stair edges or lofted spaces. Furthermore, the Roomba 690 uses the AeroVac filtration system filter out fine particulate and debris. Whereas, the AeroForce filter is smaller compared to this filter but this one is curved and larger. The AeroVac filter takes much space in the dust bin, but the level of filtration is comparable. The Roomba 890 follows the similar three-stage cleaning process. The only difference here is the dual brushrolls instead of single brushrolls which are also known as debris extractors. This dual system is ideal for pet owners and people with long-hairs because the brush never tangles due to hairs. The edge sensors are also similar, even at the same place as the 690. The memory-mapping feature allows the robot to navigate efficiently around your home. This feature uses its infrared light to read the space and remember obstacles and layouts. Instead of moving here and there, the robot moves efficiently and eliminates bumps. Similarly, HEPA filtration is another improvement that helps keeps the allergens trapped. Furthermore, the Roomba 890 comes with an AeroForce filter which as mentioned earlier is smaller, and takes less space in the bin resulting in more dirt in the dist bin, without sacrificing filtration. The Roomba 690 has 13″ diameter and is 3.6″ tall. It’s pretty much average on the spectrum of robot vacuums and can penetrate under furniture or into tight corners. Roomba 890 has a diameter of 13.9″ and is 3.6″ tall. Still, the size is standard and easy to sneak under furniture or tight spaces. The Roomba 690 offers great usability. The user-friendly interface and wifi connectivity makes it easy to use for everyone. Either it’s unboxing, installing the spinning brush, charging it up, or letting it lose, everything is pretty simple. The only thing that requires a few minutes is the smartphone app which is completely optional. You can also start the robot by pressing the “CLEAN” button on the top of the vacuum. The Roomba 890 is comparable to the 690. Usability of this robot is totally similar to the Roomba 690. It also involves wifi connectivity, installing the spinning brushes, allowing time for a full charge. And the user-friendly interface allows even a newbie to deal with this vacuum. Either start the robot by the “CLEAN” button or the app installation,, registration and robot setup will take only a few minutes. Here comes the major difference between both Roomba vacuums. The Roomba 690 lacks memory-mapping and uses dirt detection technology for maneuvering with which it identifies the dirty spots and traffic patterns. This approach results in bumps which makes it less efficient. The Roomba 890 is no doubt better in navigation than the 690. The Roomba 890 navigates with the help of onboard camera and memory-mapping. The advantage of memory-mapping is that the entire layout of your home is created virtually like a map by the Roomba that helps Roomba to navigate easily in your home avoiding bumps. Additionally, the dirt detection feature also plays an important role in navigation. The Roomba 690 is a consistent model and requires regular checking of filters, brushes, dust bin, and other accessories. The bristle-style brush requires more maintenance if you have pets in your home. The Roomba 890 has almost identical maintenance, but not extremely identical. The Roomba 890 also requires regular maintenance of dust bin, filter, brushes and other things to keep your Roomba running smoothly. The annual cost for Roomba 890 maintenance is $36. Unlike Roomba 690, the 890 comes with an advanced dual brush rolls which are rubberized to help prevent hair tangles either you have long hairs or your own pets. The Roomba 690 comes with a 1,800 mAh battery that gives a run time of 90 minutes. The Roomba 890 also comes with a 1,800 mAh battery that gives a run time of 90 minutes. At 3 ‘away, the Roomba 890 robot vacuum emits 68 dB of sound. The Roomba 890 comes with amazing upgrades like dual brushroll, memory-mapping, and other features which in return provides great value. Honestly, both the Roomba 890 and 690 are both strong contenders. Both offer amazing cleaning performance, but the Roomba 690 has a lower price tag, but the Roomba 890 comes with several improvements but at a slightly higher cost that could be a real deal breaker, depending on what you are looking for. Both robots have a similar interface, similar features, but the 890 has improved HEPA filtration system, memory-mapping technology, and advanced dual brushroll to deal with pet hairs. Both robots have virtual wall barrier, but the Roomba 890 comes with advanced brushroll, filter what gives it an upper hand here. Cleaning performance is better for both robots but the 890 has better navigation which results in better cleaning performance due to memory-mapping and the 890 also wins this category. Both robot vacuums are user-friendly and identical in terms of usability so it’s a draw. Both the Roomba 890 and 609 are comparable in terms of maintenance and cost almost identical annually for maintenance. Both of these vacuums have similar batteries, give similar run time and takes a similar time to recharge. Both robots produce the same noise regardless of the types of floor, or navigation. 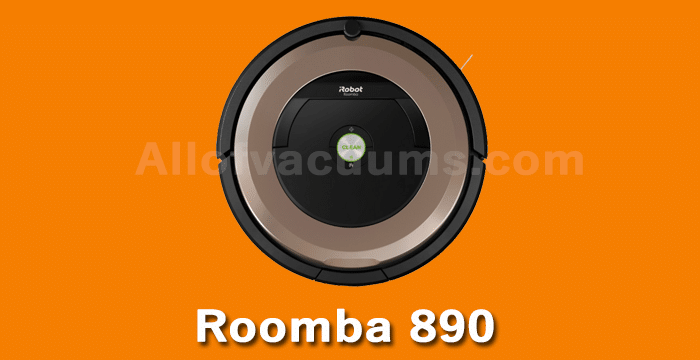 Regarding value, the Roomba 890 offers great value due to advanced features that it comes with. The Roomba 690 robot vacuum offers incredible cleaning performance, great price, wifi connectivity, and voice control. These features not only make it a modern robot vacuum but without breaking the bank. You want to get premium features without spending too much. You want a smaller footprint due to tight layout or unique furniture of your home. The Roomba 890 might have a slightly higher price tag, but the advanced features like dual brush rolls (to deal with pet hairs), memory-mapping ( for smooth navigation). Overall, the technology advancements make the 890 a smarter robot vacuum. Similarly, the full dust bin indicator is a great addition. Want an improved filtration system because the 890 has an AeroForce filtration system. You want an improved brush roll that not only captures dirt, dust, and debris but also picks up pet hairs without getting tangled. You want a memory-mapping feature that allows the robot to navigate smoothly in your home and avoids bumping with obstacles. engineered hardwoods, low pile carpet, and high pile carpet.